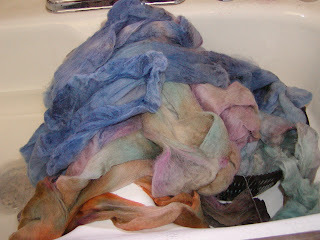 I am going to call my style of dyeing freeform, since I do not measure and I am mixing without keeping a record. I am surprised at how cool these colors turned out. The stuff in the bottom of the pot always looks the best. I end up with the dilemma of do I sell or spin myself? The above is a middle layer. The above is the top layer. 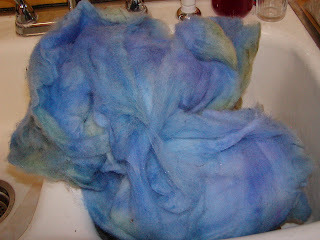 The above is three pounds of commercial merino that I dyed in the above method, using a different batch of colors. I really did this one to see why everyone I know is selling the merino and it looks and feels felted. 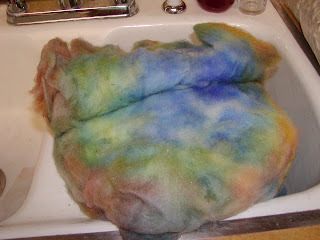 This did not turn out that way, so I am not sure what other dyers are doing. 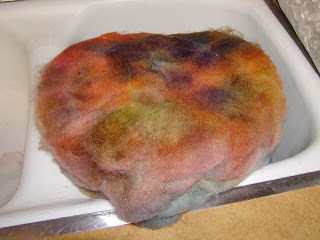 It takes a lot more dye to get brighter colors in the commercially processed stuff. The bottom still turned out to be the coolest part of the dye bath. I am out of vinegar, so can't throw any more fiber in the pot until I hit Costco again!